When did it suddenly become autumn? Leaves need raking, boots need polishing, and I’m craving hot chocolate. Granted, our recent cold snap has given way to positively spring-like temperatures, but that’s typical DC fall for you… it isn’t going to stop me indulging in my favorite seasonal drink. ACKC is a dangerous little shop and cafe at 14th & Q NW that could cause chocoholics to go into palpitations. Lacking a serious sweet tooth (more like a deer with a salt lick), I can enter without too much concern about breaking the bank on artisan chocolates, though bars with almonds and sea salt sure are tempting. And then again, now through February’s end, I do go crazy for hot chocolate. I don’t know why, maybe it’s when the weather turns dreary, the melancholy of the impending chill, but there’s something innately comforting about the magical liquid. My favorite at ACKC is their European-style “Audrey Hepburn” – utterly decadent, thick and rich, meant to be sipped and savored over an hour – solo or easily coating a buttery croissant, if you want to go crazy dunking a pastry (and you know you do). 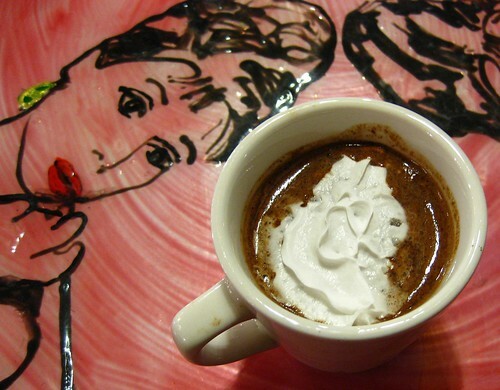 Beyond the “Audrey” are other adventurous versions of hot chocolate, all named for divas – like the “Rita Hayworth,” a beautiful concoction adding clove, orange, and caramel. 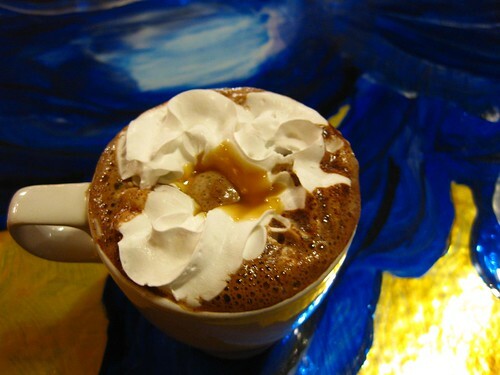 These drinks are less thick than the “Audrey,” but with the addition of exotic tastes like lavender, chipotle, ginger, or even wasabi, they accentuate different aspects of chocolate and are truly lovely to look at as well. The cafe itself is vibrantly colored with interesting art, including the table surfaces themselves. The chairs are not quite as cosy as I would prefer for a long respite with a mug of hot chocolate, but it’s still a great spot to sit and watch the passersby on 14th Street. The staff will never rush you out into the cold. And for gifts for the chocoholics in your life, the shop cannot be beat. So cheers to autumn (whenever those chilly days return), and say hello if you see me sipping there with a faraway look on my face. oooh love love love! must try. i get mid-day HC cravings too! Next time you go, have the fleur de sel caramel truffle. I make involuntary Homer Simpson noises every time. Jenn, I see there is nothing in your review about the… overly anatomically correct, glittery, man-mosaic. And Brittany, I totally didn’t notice the mosaic!! Wow, I’ll have to be more observant next time. There is more than one ACKC. Look for another down in Alexandria, in the Del Ray area.